Our fans were more than familiar with seeing and hearing Vince McMahon on WWE broadcasts — including Raw — but it was The Chairman’s storied rivalry with “Stone Cold” Steve Austin that made Mr. McMahon an unforgettable part of Monday nights. A devious authority figure that opposed the rebellious Texas Rattlesnake at every turn, Mr. McMahon was arguably just as crucial to Austin’s meteoric rise during The Attitude Era as the finger-gesturing, beer–guzzling, “Stone Cold” Stunning Superstar himself. 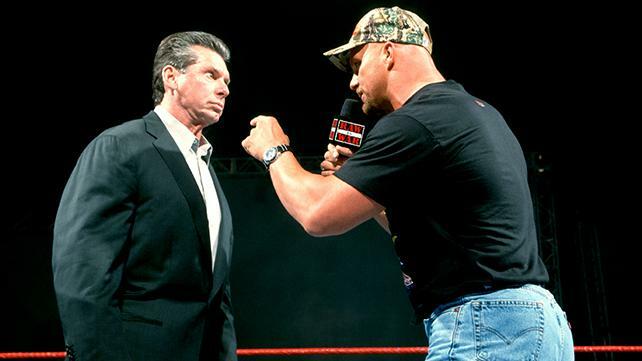 When he wasn’t lamenting the loss of his prized Corvette, wringing the beer out of his custom-made suits or putting ice on the bedpan welts on his head — all of which could be attributed to The Texas Rattlesnake — Mr. McMahon was focused on overseeing the ascent of his “Corporate Champion” The Rock (you might have heard of him), training for the 1999 Royal Rumble (which he won) and even winning the WWE Championship from his future son-in-law, Triple H.
Oh and remember how WCW’s Monday Nitro was trouncing Monday Night Raw in the 1990s? Mr. McMahon would celebrate a definitive victory over Ted Turner’s rival organization in March 2001, when WWE purchased WCW.